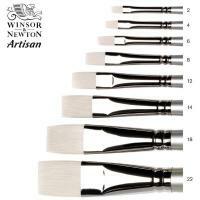 Artisan brushes have been specifically designed to have the performance characteristics of hog bristle yet maintain their spring and shape when in contact with water, particularly during long painting sessions with water mixable oil colours. Developed with a unique blend of high quality synthetic fibres, the brushes are strong and durable and are perfect for working with thick, full bodied colour straight from the tube. What is Artisan Water Mixable Oil Colour? 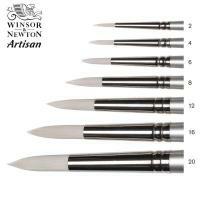 Artisan is a genuine oil colour made from modified linseed oil and modified safflower oil. It performs just like conventional oil colour but can be thinned and cleaned up with water, eliminating the need for hazardous solvents. 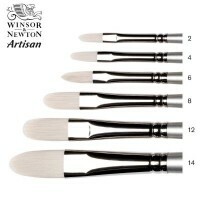 What are the benefits of an Artisan Brush? Natural hog bristle is not ideally suited for water mixable oil colour because when soaked in water, the bristle loses shape and its spring becomes weak. As a result controlling the paint becomes more difficult. 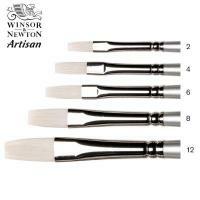 On the other hand, synthetic brush ranges are not ideally suited for use with oil colour. This is because they are generally developed for acrylics and the blend of filament can be too soft and too flexible for use with full bodied colour straight from the tube. This is why Artisan brushes provide the perfect balance for this special type of oil colour. They are able to maintain strength, a fine point, excellent spring and durability use after use with water. 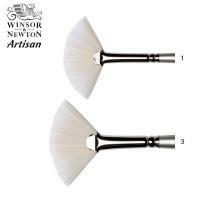 And best of all Artisan brushes (with Artisan colour) can be cleaned with soap and water only - No solvents required.